Most folks who are undergoing orthodontic treatment with Dr. Barry Glaser of Glaser Orthodontics near Yorktown Heights, NY don’t intend to make a statement with their braces. Then there are patients who do. If you are straightening your teeth with braces, why not spice them up a little with some color? 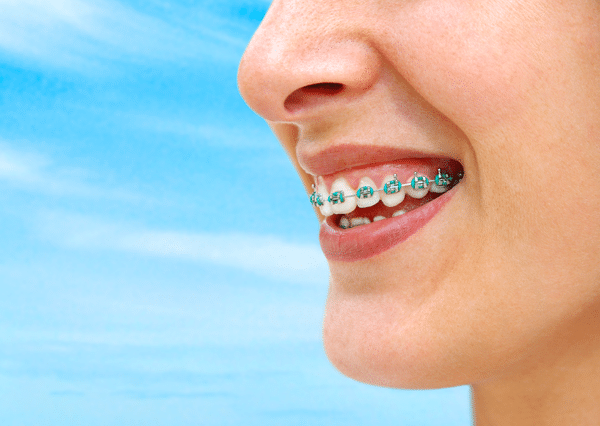 Your orthodontist may offer different colored elastics that can be affixed around each bracket. They’re really called ligatures and are used to hold the arch-wire in place. They’re changed about every four-to-six weeks, so a patient can create a new look with each orthodontic treatment visit. The common colors that patients choose for their ligatures include shades of blue, green, yellow, orange, red, pink, and purple. Gold, dark blues, orange, green, or purple can complement a darker skin tone. Light blues, dark purples, and dark shades of red or pink can complement a lighter skin tone. Darker colors can make your teeth appear whiter; lighter colors can give your teeth a yellow tone. Which colors compliment your eyes? What colors coordinate with the clothing that you usually wear? You can choose to combine color braces for your favorite sports team or school organizations. The Glaser Orthodontics associates say that some patients like to get specific color schemes for certain holidays like red and green for Christmas, or red, white, and blue for Independence Day. There are some colors that you may want to avoid, however. Black, brown, or dark green may mimic food stuck in your teeth and white can possibly make your teeth appear yellow. Red symbolizes energy, strength, and determination. It is an intense color with high visibility, but it’s possible to use a lighter or darker shade to reduce this effect. Blue is often associated with depth and stability, as well as calm and tranquility. It is a masculine color that can create vibrant designs when combined with warmer colors like red or orange. Purple is associated with royalty, wealth, luxury, and power. It can also symbolize wisdom, creativity, or mystery. Green represents freshness, growth, and harmony. It can be associated with money or peace. Orange symbolizes joy and happiness. Orange is highly visible and can be used to make exciting color combinations. Yellow represents honor, loyalty, and cheerfulness. It also symbolizes intellect and energy. Just like red and orange, it’s a very visible color.